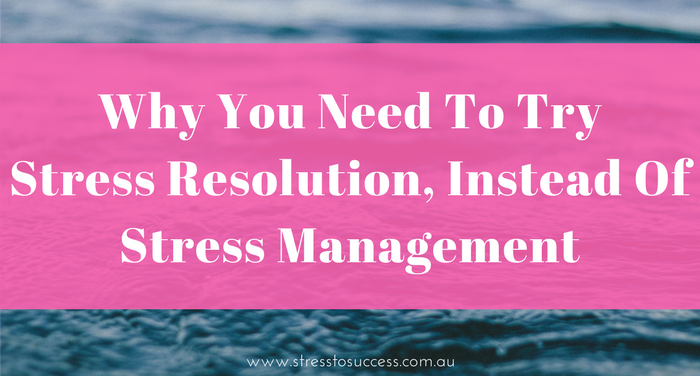 Why you need to try stress resolution, instead of stress management. Why keep stress if you can resolve it! Recently I met a client who was trying to juggle too much. She was a mum and a professional, with a high-stress career. Between work, looking after her family and managing her kids’ commitments, it’s no wonder she needed help with stress-related issues. She had tried many different recommendations, such as meditation, exercise, holistic therapies and diets – but still she found it impossible to truly get a handle on her stress day to day. I explained to her that the methods she had been trying were stress management. While some of them might work well temporarily, I told her that what she really needed was stress resolution. In other words, solving stress permanently. 1. Understand the difference between stress management and resolution. Stress management implies that there is really nothing we can do to stop stress. That you will never be able to get rid of it altogether, so the best you can do is try to manage it. Stress resolution on the other hand, is about getting to the root cause of the hidden, underlying issues in order to resolve your stress permanently, not just manage it. 2. Understand the underlying causes of stress. Stress is initially about survival, and how we respond to perceived threats. When I talk about stress I am talking about your stress response, which is a habit. How you respond to stress, and what is actually causing it is regarded as personal and individual. However, the physiological response is universal. It is this habit, and physiological response, that we need to change in order to resolve stress once and for all. 3. Understand how to change your stress response – permanently. The key is to gain control over one aspect of the subconscious mind, a habit associated with stress. You cannot get rid of habits. What happens is that you create new neural pathways to overrule the previous habit. It has also been found that it takes approximately 30 days to set a new habit. The link between the conscious and the unconscious is the breath. So, in stress resolution we focus on retraining people to breathe correctly so that they not only get more oxygen which helps replenish the body and mind, it also helps the breathing apparatus become relaxed and this then helps the person slow down their response to stress. When we were able to retrain this one aspect for my client, therefore changing her physical stress-response habit, she has found that she is now able to function more effectively and have a stress-free life, knowing that she now has the skills to permanently resolve her stress. Celine Healy is a Stress Resolution Specialist. A Speaker, Author and Trainer, her expertise lies in taking career professionals and corporate business from Stress to Success.